Cook tortellini as directed on package. Drain. Rinse with cold water to cool; drain well. 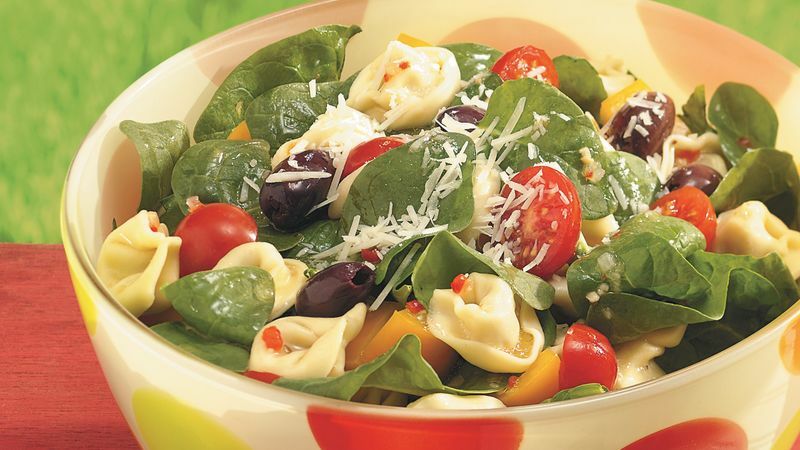 Meanwhile, in large serving bowl, combine bell pepper, tomatoes, olives and spinach. Add cooked tortellini to vegetable mixture. Pour dressing over salad; toss gently to coat. Sprinkle with cheese. Meat-filled tortellini can be used in place of the cheese-filled variety. Red or green bell pepper can be used instead of the yellow. One cup coarsely chopped tomatoes can also be used if you don’t have cherry tomatoes. Cook the pasta the night before and toss with a teaspoon of oil. Store in a resealable plastic bag in the refrigerator until you’re ready to assemble the salad.